A New Job Crisis in the Humanities? At the annual convention of the Modern Language Association in Philadelphia last month, shrinkage and decline were palpable. The book exhibits that used to fill a large ballroom could have been accommodated in a small bar room. Attendance was down: I don’t know the figures, but elevators in the Marriott and Loews were nearly empty, and all the sessions I went to had more empty seats than occupied ones. 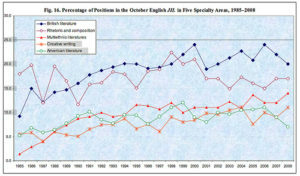 Hundreds of graduate students in English and foreign language departments were there without a single job interview, or with just one or two.To be specific about that last indicator: the MLA’s annual forecast of job listings predicted 35% fewer positions in English than last year, and 39% fewer in foreign languages. If you add on the decline that took place from 2007 to 2008, the figure is over 50% in both areas, over the course of two years. (See <insidehighered.com>, Dec. 17, 2009.) Two years ago there were already far fewer jobs than job seekers. Ph.D. programs have been graduating a steady number of young scholars and teachers. So the shortfall of jobs in comparison to new candidates is well over half. Then figure that among the 2009 candidates–in Philadelphia or staying home because they had no interviews–were many who failed to get jobs last year, or got only one-year jobs, and the shortage looks like a disaster. It gets worse: a lot of the positions listed will be canceled, if recent trends hold, because universities will withdraw funding from departments, midyear. Finally, many of the jobs listed are temporary positions, full- or part-time, rather than standard, 3-year assistant professorships on tracks leading to possible tenure. It’s dismal. Early news from other humanities fields is similar. History listings dropped 23.8% in 2008-09, and an additional 15% of searches were canceled. In classics, around 40 departments planned to interview candidates for jobs, compared to 50-plus last year and over 70 the previous two years. Even in the affluent field of economics, academic listings dropped 19%. Ph.D.-holders in that field often seek and take nonacademic jobs, but such listings were down even more, as the crash forced corporations and governments to cut budgets. That sounds like a plausible explanation for the drop in college and university jobs, too, since the job-hunting seasons covered by these numbers are precisely the years of the economic panic and collapse. On that hypothesis, if the recession is ending, academic jobs will slowly or quickly return. Don’t count on it. Without venturing to guess whether the recession is in fact over, I think it highly unlikely that the number of jobs listed in English, foreign languages, and other fields will double any time soon, back to their 2007 levels. To put the job crisis in context: 40 years ago, the rise in academic employment crested. Some of the more durable RT board members remember vividly what happened at MLA in 1969. The convention had been moved from Chicago to Denver, in protest against the riot of Mayor Daley’s police force against protesters at the Democratic National Convention in 1968. Radical Caucus people showed up ready to raise more hell about the war, racism, male supremacy, and so on, to find that a jobseekers’ Caucus had formed to raise even noisier hell about the collapse of the job market. No interviews, basically. No jobs. This seemed like a blip, at the time. But as it turned out, the postwar boom in higher education had peaked. Employment in the humanities had hugely expanded for two decades; since 1969 it has drifted down and up and down, and is now roughly at 1968 levels, although student populations have grown apace. The proximate cause is clear: universities have learned to pay a lot less for teaching than they did in 1968. They have hired more part-time teachers, and way more full-time teachers on short contracts, with no security and no or few benefits. As of two years ago, fewer than one-third of faculty members in English were tenured or on the tenure track (“Education in the Balance: A Report on the Academic Workforce in English,” MLA, 2007). You can bet the percentage is smaller in 2010, and bad, though not this scandalous, in many other fields. In a recent blog on this site [I ASSUME THERE WOULD BE A LINK HERE, IF WE WERE DOING THIS FOR REAL], Paul Lauter noted that the shift to contingent labor in English “was part of a broader effort to roll back the post World War II settlement that had brought unparalleled prosperity and opportunity to working Americans.” Corporate capital in the U.S. ran into serious trouble about 1970 in competing with Japanese and European capital, as well as paying for the Vietnam War, and began a long campaign to undercut job security and pay, globalize production, outsource and subcontract, bust unions, and the whole array of strategies that have given us the casino capitalism we have now. College teachers have been whacked along with other workers. So have physicians, attorneys, and accountants, though they are hardly starving. The campaign of neo-liberalism to reshape capitalism has been invading the market havens of the professions, our defense–for over a hundred years–of autonomy and decent pay in the war of all against all. A familiar dilemma for radicals: we look deep, and see historical movements that make patchwork solutions seem all but worthless. Do we just keep saying that, while working for some distant transformation of capitalism? Do we join local battles, knowing that we’ll win some but still be on the losing side in the long struggle? Try to join with workers across the whole economy to win control of it? These are vexing questions, to me. I’d welcome other people’s answers and critique.